In the Spirit of Patrick our Patron, we witness the Gospel of Jesus Christ to all people of faith. 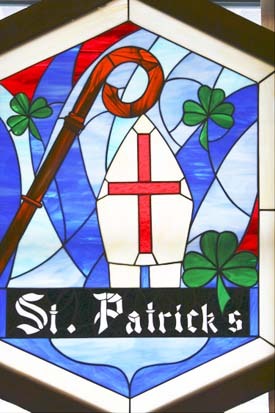 We at St. Patrick’s work together to create a welcoming place for all to live and grow in the Christian faith. We reach out our hands in healing and ministry as we gather around the Table of the Eucharist. 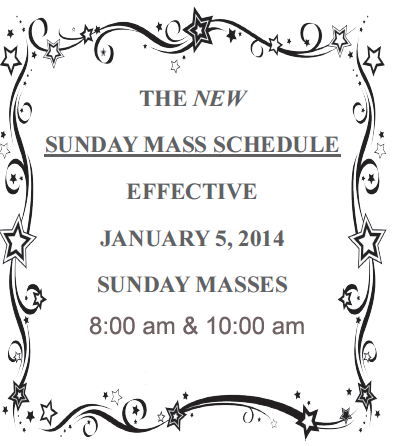 Mon.& Tues.,- 8:30 a.m. to 4:30 p.m.
Wed.- 8:30 a.m. to 1:00 p.m.
Holy Days: 8:00 a.m. 7:00 p.m.
Penance: Saturday, 3:15 to 3:45 p.m. Please intoduce yourselves and register in order to become a member of this community of believers. We welcome your gifted presence in the life of our parish. Marriage: Arrangements must be made six months prior to the wedding date. Call the rectory. Baptism: The Sacrament of Baptism may be scheduled on any Sunday except during Lent. Only one baptism can be scheduled per Sunday. Hospitals: Visited regularly. Please notify the rectory with the names of hospitalized parishioners. Holy Communion at Home: Please notify the rectory of any parishioners who can't attend mass due to illness, handicap or age. Anointing of the Sick is a sacrament of healing and strength for the sick. Please notify the rectory with the name of any parishioner wishing this sacrament. 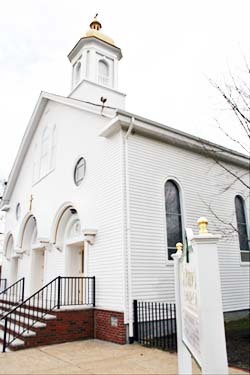 Church is accessible to handicapped via parish center entrance. ©2019 - All Rights Reserved - Site maintained by Fran-Tec Computer Co.